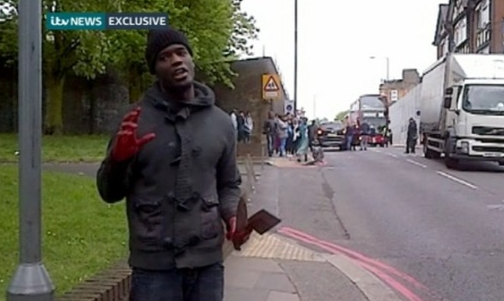 This is a day everyone hoped will not come, a man stands in the street – in London, his hands bloody and his English sounds as good as can be, he apologizes to the camera about the fact that “women had to see this”. And by “this” he means that he (and another person) just murdered a person in the street – and decapitated him. This man also says something even more important to note – referring to “their” lands, muslim countries, this is how it is. Of course it is, infidels are murdered and their heads are cut off, while screaming “god is great” to signal that this is a murder for the sake of god, because stone age gods ask for blood, and its got nothing to do with the person being killed, its got nothing to do with any diplomatic moves of the UK or any country, it simply is because he is not a muslim – and a muslim of the type and kind that is perfectly aligned to that of those who killed him. Now wait to hear back from the English far right, they will say “we told you so” and unfortunately, they will be right.